It is fall and we started quilting again. The first week we did two tied quilts. It was the ideal start for me because I didn’t have to prick my fingers too much as I tried to remember how to quilt after a summer of not sewing. Then we put one that we would hand quilt on a frame. It is a lovely one that belongs to a local family. Someone years ago pieced it together and then it was put away for one of the myriad of reasons that personal projects are put away. The pattern is one most of us weren’t familiar with but Bonnie finally discovered that it is called Kings Highway. I took some photos that week thinking I should really get back into the routine of writing this blog. But the days came and went and somehow I never found the right moment to write (I suppose this is the difference between me and a professional writer who can produce on a regular schedule). This past week as we kept rolling the quilt frame in as more of the stitching was done, Cathryn finally decided it was time to set up a second frame. The old school house has enough space that we can easily have two quilting frames set up at the same time. 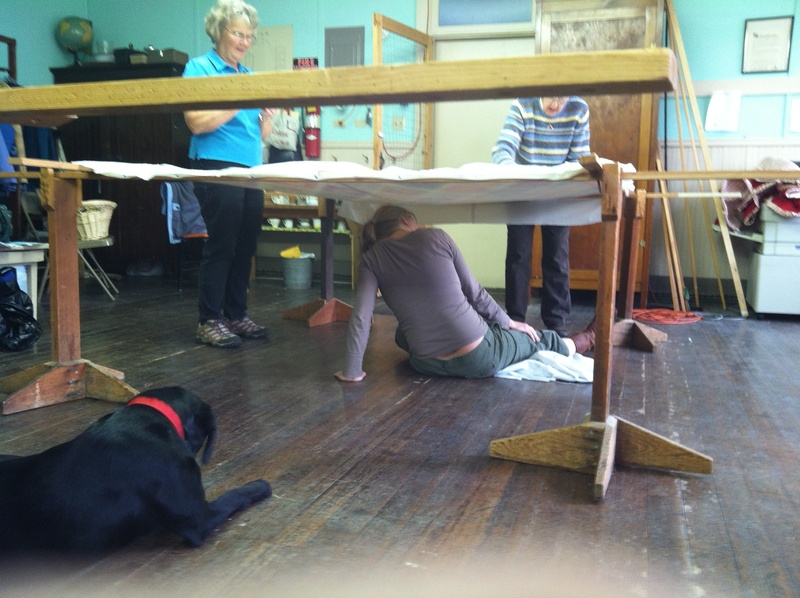 So Lynda and a few others started to put a new quilt on. Fortunately we had Siri to crawl under to help with the basting. Molly, the dog, found this all rather amusing. Often Molly wanders under the quilts as we sew and has to be content with our knees. Having Siri on the floor was much more entertaining.